In a greenhouse experiment, we assessed the impact of the most widely used glyphosate-based herbicide Roundup on two earthworm species with different feeding strategies. One of the herbicides applied in the study was “Roundup Speed” which contains the herbicide pelargonic acid in addition to glyphosate, so it is impossible to conclude anything about the direct effects of glyphosate. More importantly, the researchers didn’t include a control treatment where they killed the plants without herbicides. All of the effects on earthworms and nutrients observed in this study could simply be due to killing the plants in the pots. It is perfectly plausible the exact same effects would be observed if the plants were clipped or pulled out of the pots. There are a couple items of note here. First, the researchers made three separate herbicide applications over a 4 day span. This seems very odd. I’m speculating here, but my guess is that when they were conducting the study, the authors didn’t realize how slowly glyphosate works. It is not uncommon for glyphosate to take 10 to 20 days to kill plants under greenhouse conditions, especially plants of the large size in this study (7.5 to 15 inches tall at application). When they didn’t see immediate results from the first application, they reapplied the herbicide on day 2. Then, after seeing no immediate results from the second application, they went to the store and found a product named “Roundup Speed” which then caused nearly instant results. Again, this scenario is speculative on my part, but would explain the very unrealistic herbicide application pattern they used. The unfortunate choice to use “Roundup Speed” for the third application brought in a major confounding factor. In addition to glyphosate, Roundup Speed contains a second herbicide active ingredient (pelargonic acid). Pelargonic acid is a very rapidly acting herbicide, and is presumably the active ingredient that puts the “speed” in Roundup Speed. Another formulation of pelargonic acid advertises that “Results are usually visible within minutes after spray application.” So the rapid desiccation of the plants in this study (and possibly the other effects observed) is quite possibly attributable to this compound, and may have nothing at all to do with glyphosate. But that’s not the only problem with extrapolating these greenhouse results to field applications. I calculated the amount of glyphosate they applied to the pots (adding up the three applications they made) and converted it into the amount of glyphosate per unit area. The amount of glyphosate applied to each pot was equivalent to a field rate of 11.3 pounds of glyphosate per acre (or 12,680 grams per hectare). A typical application rate in a field of Roundup Ready crops would be somewhere between 0.75 to 1.3 pounds per acre. So the amount of glyphosate they applied is about an order of magnitude too high to be relevant to a field situation. 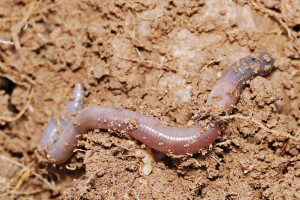 I wasn’t able to find any studies that specifically evaluated the impact of plant removal on earthworms, but earthworms can certainly be negatively affected by a reduction in plant species diversity. In this study, the plant species diversity was effectively reduced to zero; they killed all the plants with the herbicide. I’m not an earthworm expert, but I would guess that killing all the plants in an area will have a negative effect on earthworms. Especially if you keep them in the pots for three months. If the authors would have included a treatment where they killed the plants by some other method (like mowing or burning, or perhaps even an application of only pelargonic acid), then they could have isolated the effect of the herbicide. But as it is, there is no way to separate the effects of the herbicide from the confounding effects of dying plants. This is a bit of a technical point, but nitrate and phosphate “increases” of this magnitude wouldn’t be possible in this study, since the herbicides they applied wouldn’t contain that much of those compounds. Laws of physics would have been violated to increase these nutrients by this magnitude. What the authors actually mean is that the availability of these nutrients was different between the sprayed and unsprayed treatments. But again, this wasn’t a direct effect of the herbicide, but simply an impact of the plants dying. Using the same logic, the authors could have concluded that herbicide application significantly increased soil moisture, since there was a clear difference in moisture content between the sprayed and unsprayed pots. But this is obviously not the case. Differences in soil moisture were due to having live plants in the unsprayed pots taking up water from the soil, and dead plants not taking up water. It is the same for nitrate and phosphate. Plant matter (roots, leaves, etc.) is made up of soil nutrients (among other things), and therefore when the plant is growing these nutrients are taken up and no longer freely available in the soil. In this study, the plants continued to grow in the unsprayed pots, and so those plants continued to take up nitrogen and phosphorus from the soil. In the herbicide-treated pots, the plants stopped taking up nutrients, leaving more nutrients available in the soil. In addition, as the plants died, it is possible some of the nutrients in the plants may have been mineralized, or returned back to the soil as the plants decomposed. The herbicide treatment didn’t actually “increase” these nutrients. What the the authors observed is simply a difference in the available nitrogen and phosphate in the soil due to differences in plant growth between the treatments. This is certainly not a novel finding, and would be expected for any study where living plants are compared with dead plants. Which, again, is why a plant removal control treatment (clipping, pulling, eating, whatever) would be necessary to draw any conclusions from this study. Next Article Want to reduce herbicide resistance? Spray more herbicides!